Image Size: 16" x 20" - Actual Size with Border: 20" x 24"
In Stock! - Order Today! Greg Bohn's legacy as a legendary Northwoods' fishing guide has been recognized for all time. He was recently informed of his 2016 induction into the National Freshwater Fishing Hall of Fame in Hayward, Wis. Bohn also excels as a tackle designer, seminar speaker and a prolific writer of hundreds of published articles and several books on walleye fishing during his longtime career. Many local guides and Wisconsin anglers agree Bohn is one of the best walleye guides to come along in decades. His ability to produce walleyes for his clients almost at will, day-after-day for over 40-years puts him in elite company. Bohn was often booked a year in advance and never had a business card. His 24.6 daily walleye average, humble style and innovative walleye catching techniques have made him a local Northwoods' legend. His reputation as a big-fish guide is unequaled. Both the Wisconsin 25-pound and Michigan 17-pound world line-class walleye records caught by his clients are current, according to Emmett A. Brown, Jr. Executive Director for the National Freshwater Fishing Hall of Fame. 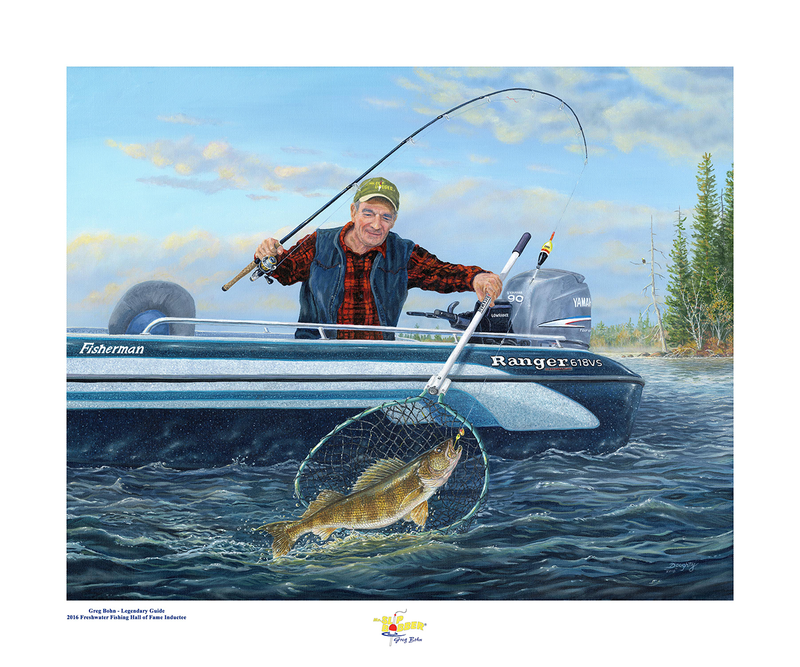 He personally held four “Catch & Release” line-class walleye records at one time. Of those, only one is current. Greg Bohn has guided not one, but two of his clients to 15-pound walleyes and another to one over 14-pounds. His 56- inch, 44-pound, 8-ounce musky was the longest registered in North America in 1993. The fish took first place in the prestigious Vilas County Musky Marathon contest. Greg Bohn started guiding professionally in Wisconsin at a young age, first in Crivitz on High Falls and Caldron Falls Reservoirs and later in Minocqua, Wisconsin. Terry Doughty's career in wildlife art has spanned over four decades and has made him one of Wisconsin's most recognizable names in the artist field. Over the years, he has won numerous wards, gained recognition for his amazing elk prints to help fund Wisconsin's elk reintroduction efforts., as well as two runner-up finishes in the world-renowned Federal Duck Stamp Contest. He has won 15 Wisconsin stamp design contests which included the 2016 Wisconsin Waterfowl Stamp and 2016 Wisconsin Pheasant Stamp. He is a self-taught artist who finds his work an endless inspiration. Every once in a while, you put out a really spectacular piece where everything just comes together. But an artist is the same as a musician; he never stops learning! Always learning some little brush stroke or the use of light, that will make your next painting easier to do. Its a learning process that keeps going; never ending. Terry lives his art. An avid fisherman and hunter, he does not separate the outdoor experience from his work. Instead, he continues the experience on canvas. Color and light are central to Doughty's award-winning paintings, but equally evident are the sense of proportion and naturalness with which he approaches his subject. He applies his concern for authenticity to his animal subjects as well. Experience as a taxidermist taught him attention to musculature and skeletal detail. Over the years he has photographed and recorded scenes in the field so he could later produce work that was detailed and lifelike. As an avid fisherman, hunter and outdoorsman, Terry has maintained a lifelong commitment to wildlife and preservation of their habitat.